i'm home! after a week in vegas i'm back in colorado and ready to start enjoying the gorgeous spring weather. today i'm heading over to the boulder reservoir with the dog and then plan to stop by the farmers market. i'm bringing my camera in hopes that i can capture some great shots. with warmer weather making an appearance i'm getting really excited to start blogging on lighter, refreshing recipes. i purchased a huge 5lb bag of organic fingerling potatoes this past weekend and wanted to use them immediately - the potato colors are beautiful - the bag contains baby yukons, baby reds and baby purples. 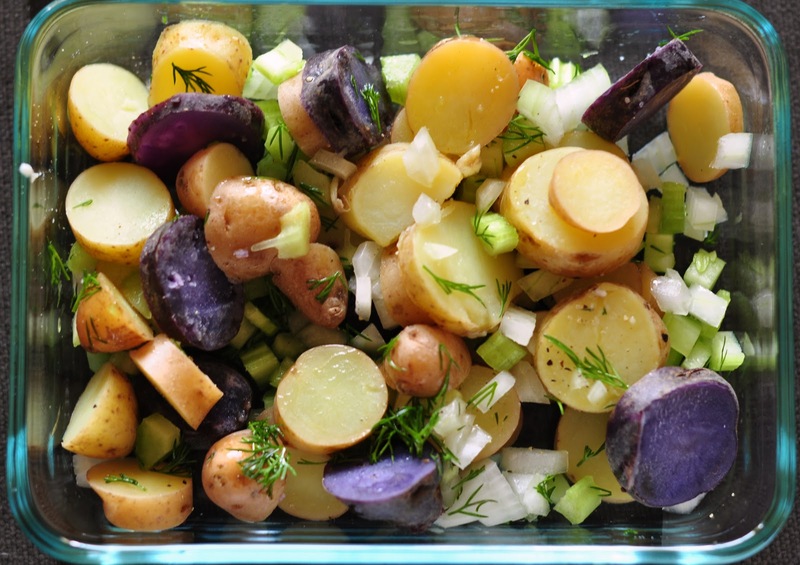 the colors combined make for a colorful potato salad. i'm a huge potato salad fan and wanted to try and put a fresh spin on the traditional version. to do so, i dressed this potato salad with olive oil, white wine vinegar and fresh dill instead of mayonnaise. to begin boil a medium pot of water seasoned with kosher salt - add in potatoes and boil until they are fork tender around 10-15 minutes. while the potatoes are cooking dice sweet onion and celery. once potatoes are cooked strain well then place in serving bowl or pyrex bowl (if you haven't already stopped using plastic storage containers STOP NOW!). carefully stir in onion, celery, dill and drizzle with olive oil and white wine vinegar. season with salt and pepper to taste. if you choose to add in hard boiled egg - place eggs in cooking pot and cover with water until submerged. bring to a rolling boil - allow to boil for 2 minutes. cover pot and remove from burner. allow to sit 12-15 minutes. run cold water over eggs to stop the cooking process. once eggs are cooled, peel and dice - then sprinkle on top of the dill potato salad. i do this at 5,400 ft above sea level - you will definitely need to adjust depending on where you live. this is a perfect spring/summer side dish - i've served up with bison hot dogs and pickles. its light and refreshing and not nearly as heavy as the its usual mayonnaisey counterpart. hope you all have wonderful weather, and a restful weekend. Hi Katie! This potato salad just screams "warmer weather"! :-) I absolutely love dill and this is my kind of potato salad because you can still see the actual potatoes and they aren't all mushed up. Thanks so much for linking this up to Inspiration Friday! This looks so fresh and delicious. love the purple potatoes too! Thos look DELICIOUS!! I love purple potatoes!! We're trying this out for easter. thanks!! Just made this tonight with salmon and it was delicious ! قم بتنظيف شاشات النافذة عن طريق الإزاحة من النسق والتنظيف باستعمال منظف متنوع المقاصد مخلوط بالماء الدافئ. دعك كل شاشة بفرشاة خشن ، شطف مع خرطوم الرياح في الرياح الطلق وإدراج مرة ثانية في النافذة حتى يجف.